There is an inconspicuous room tucked away under my grandparent’s garage that has affectionately been termed, “The Library”. The unremarkable exterior is deceptive in its appearance, never alluding to the fact that opening the door reveals a tavern of history; ancient battleships adorn the walls while ship’s badges and artefacts, accumulated throughout the endeavours of a memorable and fulfilling naval career, decorate the vast bookcase covering the back wall. It was in this treasure trove of a room that an idea for a topic hit me. I was polishing up an ancient, rickety, Gothic-style bookcase that stood coated in dust and skulking in the shadows of one corner when I happened to take a closer look at its contents. There behind the misty glass gleamed the gold embossed pages and peeling leather spines of a collection of ninth edition Encyclopædia Britannica volumes. Curiosity getting the better of me, I wiggled open the glass and was subsequently plunged deep into a bygone era of aeronautics and Napoleon, immersing myself in the most up-to-date facts that were deemed important to life in the late 1800s. I have since enquired about the origin of the imposing bookcase in question, discovering that both the bookcase and it’s contents originally belonged to my great-great-great Grandfather FW Mills who, on his death, passed them on to his first born son who in turn passed them on to his first born grandchild, my maternal Grandmother. She particularly remembers being five years old and sitting in the study of Marico, her grandparents’ house in Sea Point, on the knee of her “Oupa Frikkie” and paging through the entry on apes, being fascinated by the detailed diagrams. My Gran then vividly recalls the scene in which she received ownership of these intellectual treasures and their accompanying behemoth-esque bookcase. It was the early 1960s in the naval settlement of Da Gama Park when her Aunt Scrappy and Uncle Bill could be seen trundling up the hill in a little old Austin. As a result of its heavy cargo, its wheels almost splayed giving the impression of coming in on its haunches. 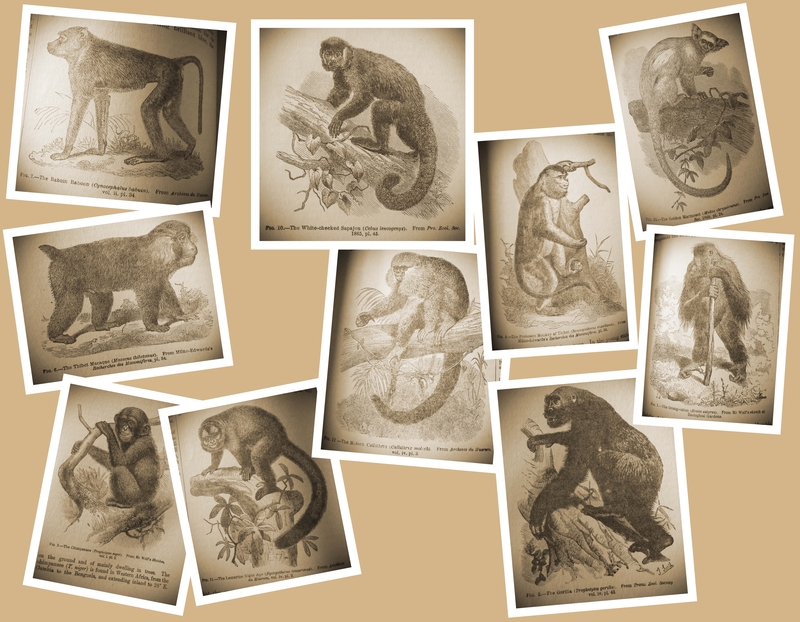 The various ape species admired by Gran as a child. 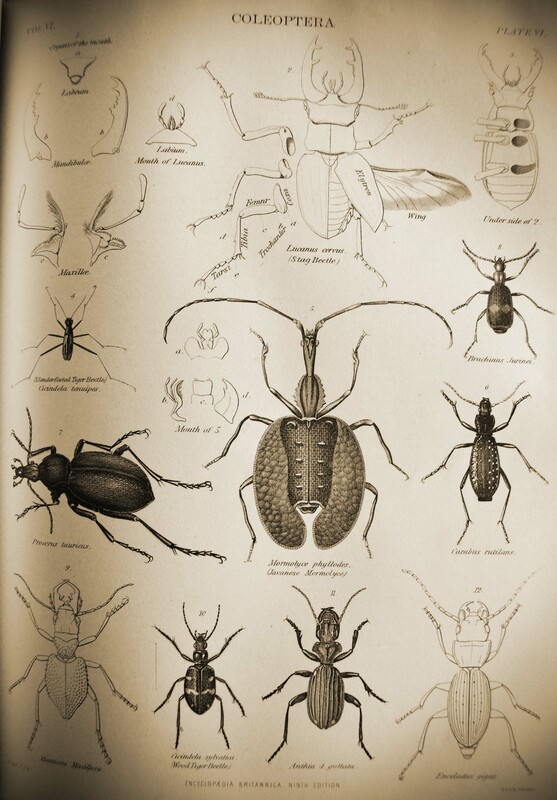 Beautifully drawn members of Order Coleoptera. (HMS Glassford), in 1955 on her voyage from Britain to join the ranks of the South African Navy. More recently (2008), the Nautilus was privately procured and converted into a luxurious yacht. Map of the Cape Colony. 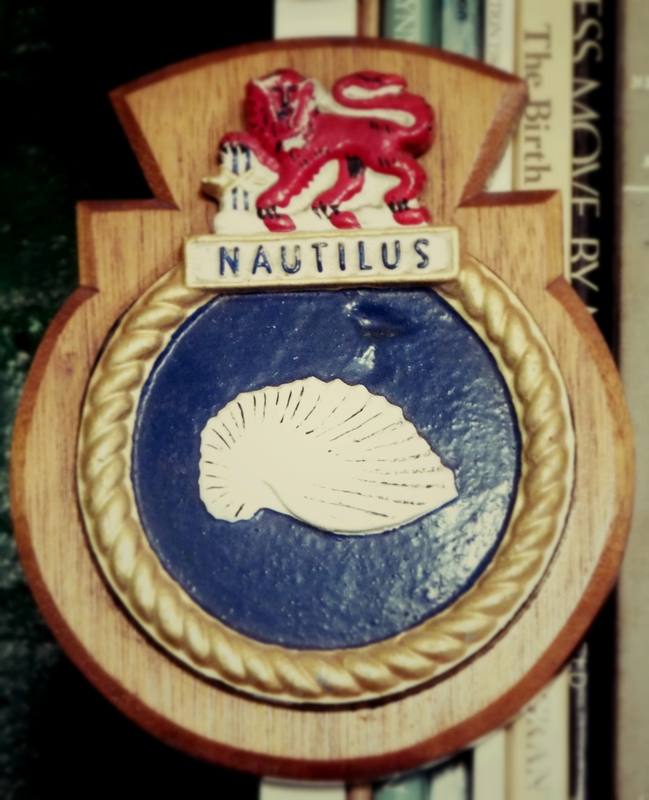 The badge of SAS Nautilus. SAS Nautilus as she originally looked (South African Navy Archives). 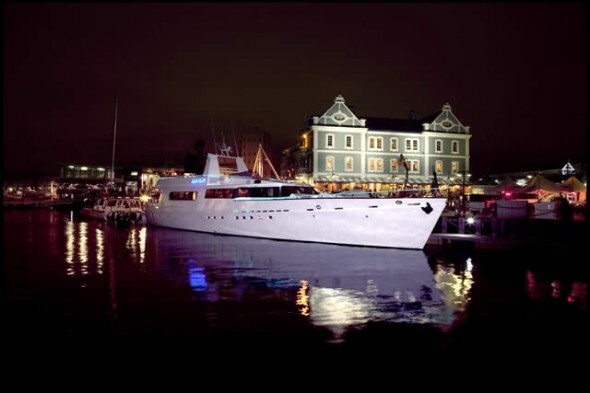 The refurbished Nautilus, now a luxury yacht docked at Cape Town Harbour (Roycher Construction). 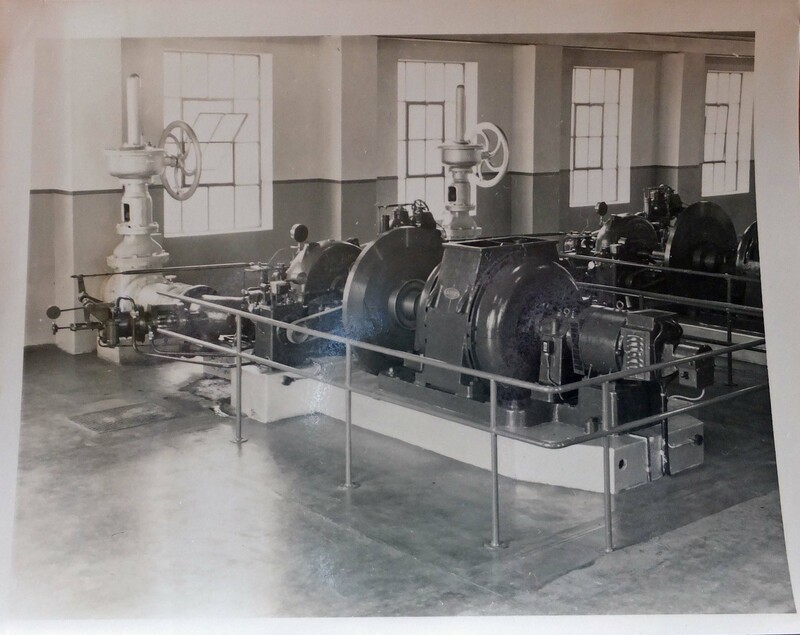 I listened to the crack of the dusty old spine as I heaved open one of the weighty volumes, discovering a long since forgotten reminder, to take a closer look at the Schools of Painting entry, and an old photograph of what looks to be a turbine component of a mill. As I dove further into the stack, I uncovered delicately folded tissue paper hidden between the thick yellowing pages and swathing heavily compressed ferns and flowers still rich with pigment. Further still and a Scottish Widows’ Fund bookmark, depicting A Hostage by E. Alverez Dumont, fell to my feet. Upon investigation I discovered that this vintage item is available on E-Bay and worth an astonishing £ 2.50! I like to think that these small discovered elements are snapshots of a more personal history enshrined within the history projected from these antique pages and no less important. I spent the remainder of the rainy afternoon surrounded by musty history, absorbing fervent tales of expedition and adventure, discoveries and battles, and thrilling descriptions of creatures and events fuelling an already active imagination. A machine possibly responsible for a stage in the milling process. 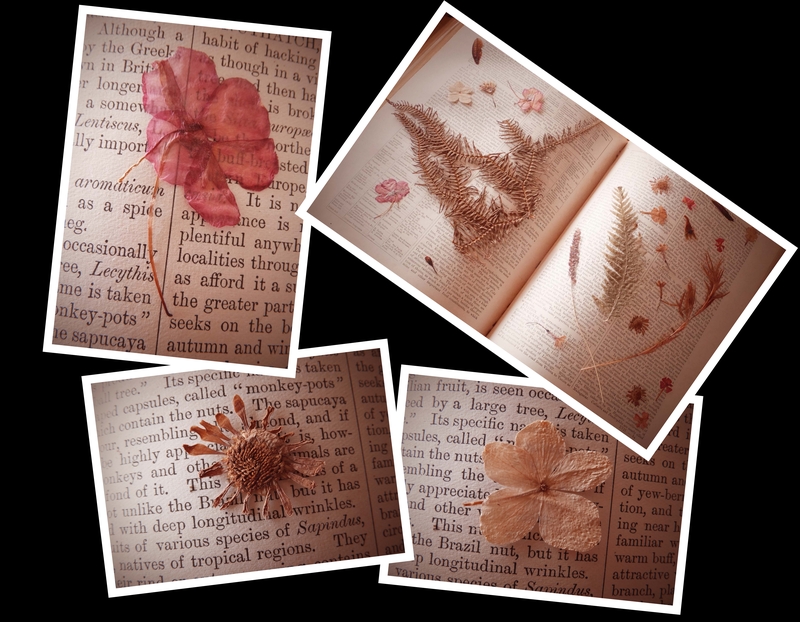 A collection of the pressed flowers found between the pages. The vintage bookmark from the Scottish Widows’ Fund. The books themselves are remarkable, before even opening a cover there is a great deal of history to be learned and appreciated from these books, not just the path that they have taken from 1898 to 2015 where they have ended up sprawled haphazardly across my desk but the information that can be gleaned from their design and the materials used to compile them. The golden crest festooning the black leather cover is similar to the coat of arms of Great Britain with the dictum of the Monarch emblazoned on unfurled ribbon at the base of the crest, Dieu et mon droit – “God and my right” (the use of which dates back to the battlefields stormed by Richard I). The motto inscribed on the garter encircling the shield, Honi soit qui mal y pense, is Old French with a literal translation of “Shame be to him who thinks evil of it”. Crest decorating the front cover. 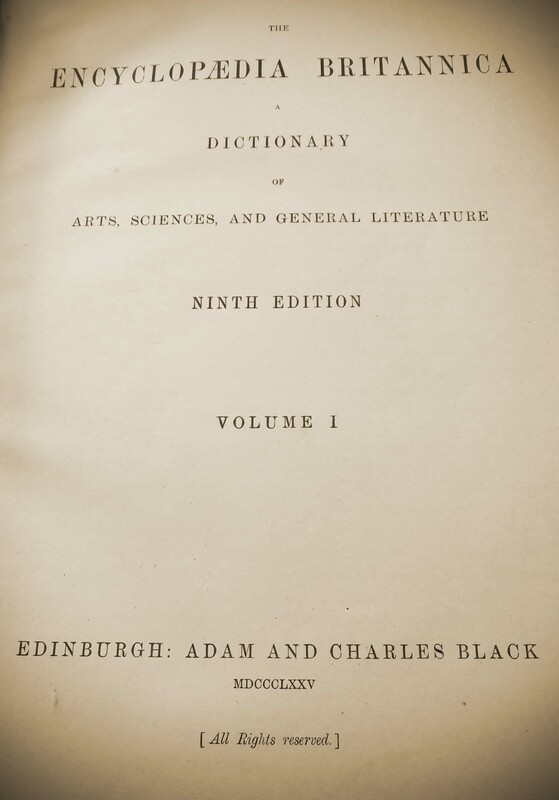 The edition itself is noteworthy, first published from 1875 to 1889 (this copy was reprinted in 1898) by A & C Black in Edinburgh and lauded as a landmark in scientific content and as such christened the “Scholar’s Edition”. This set comprised approximately 1 100 contributors, including a handful of celebrities often thought to be outrageous for their questioning of the conventional opinions of their time. These included Thomas Henry Huxley (a comparative anatomist known as “Darwin’s Bulldog” for his unwavering public support of Darwin’s Theory of Evolution), John William Strutt (Lord Rayleigh, a physicist won the Nobel Prize for Physics in 1904 for co-discovering Argon) and William Michael Rossetti (writer and poet who was one of the founding members of the Pre-Raphaelite Brotherhood in 1848). Even Robert Louis Stevenson (the famous Scottish novelist responsible for epics such as Treasure Island among others), at the tender age of 25, contributed an article about Robert Burns that was thought to be too apathetic to be included (Wells 1968). Another astounding detail that should not be overlooked is the fact that a small number of the contributors were women and that this edition was the first to include a significant article about women; Women, Law Relating To. It seems that media piracy is not a modern issue reserved purely for a pre-emptive strike on the release of the latest movies and games to hit our screens; it appears that it was rife in the 1800s with several hundred thousand pirated copies flooding the US market at $ 5 per volume. 8 500 sets were sold in Britain with a further 45 000 being produced in America at $ 9 per volume. American production of the encyclopaedia was made possible after the Edinburgh-based publishing house shipped the stereotype plates for text and graphics, along with specifications for colour, tanning quality and bindings etc., across the Atlantic in time for a simultaneous release. In a five volume supplement, the US versions included biographies and geographic information, not mentioned in the British volumes, specifically pertaining to the American way of life. Due to the fact that copyright law had not yet provided protection for foreign publications in America, a spy was implanted into the Edinburgh print factory to steal the proof-reader’s copies and speedily ship them to the US to be published concurrently with the legitimate volumes. In addition, a pirated photographic reproduction could be obtained for $ 2.50 per volume (Wells 1968). Due to the difficulties encountered in keeping information up-to-date before publication, Encyclopædia Britannica announced in 2012 that its 2010 edition would be its last printed volume converting instead to a digital format. As a result of advancements in technology, the information available to us these days has changed drastically, not only in quality and type but also in its ease of access. Because of the way in which information has previously been compiled, in conjunction with the way in which society has been organised in the past, access to it has been limited. A significant power has now been presented to a large majority of the global population through the provision of a level of information that would previously have been reserved for specific societal groups, men and a select few in the upper classes. Nowadays any person with a smartphone or access to a computer has a world of regularly updated information instantaneously at their disposal. Access to information has quite justly become a right rather than a privilege. The ability to check the reliability of information has been provided through the sheer number of available sources, to a certain degree the days of governments and corporations manipulating the information filtering through to the masses are gone (well maybe not if you are a conspiracy theorist or live in North Korea). I sadly noticed that Auschwitz got a mention of a mere seven lines with its claim to fame at the time being the seat of a dukedom. Now, with that innocence snatched away by the atrocities that occurred there, it appears forth in the Google list of suggested search items for the typed letters of “aus” and produces 19.3 million results. 109 pages on anatomy (excluding digestive, respiratory, reproductive and urinary systems), 15 pages on capillary action or 68 pages on infinitesimal calculus. 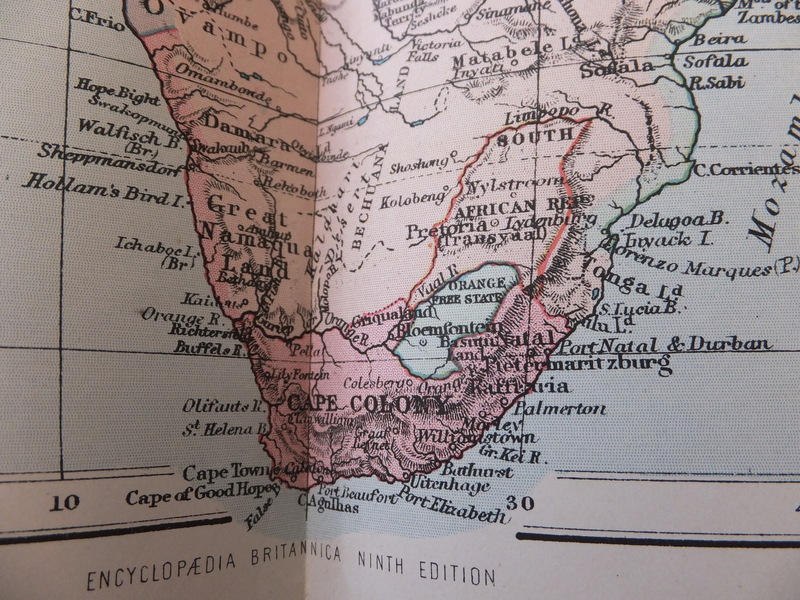 Even livestock estimates of an 1875 Cape Colony have been meticulously detailed. Another aspect that could be responsible for this shift in content is the fact that the level of knowledge expected from the general public far exceeds that of 140 years ago partially signified by the popularity of board-games such as Trivial Pursuit and more recently 30 Seconds. The level of detail included in the articles was astounding! Reading the entries contained within the ninth edition brought the 1800s to life, there are intriguing stories smattered with colourful characters and anecdotal accounts, which could quite easily have been from a Mrs Brown down the road, used to substantiate some concept or phenomenon. 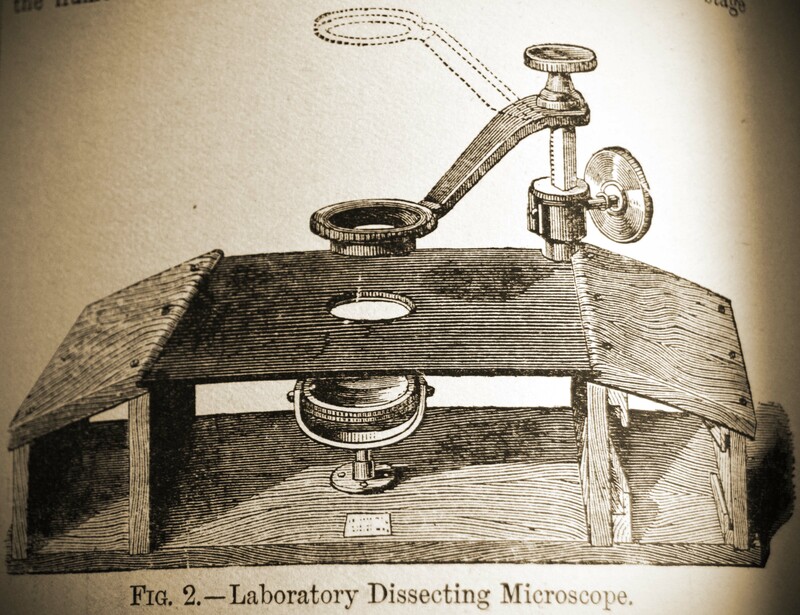 It is astonishing how many of the discoveries were achieved through merely the art of observation and a selection of relatively rudimentary instruments. 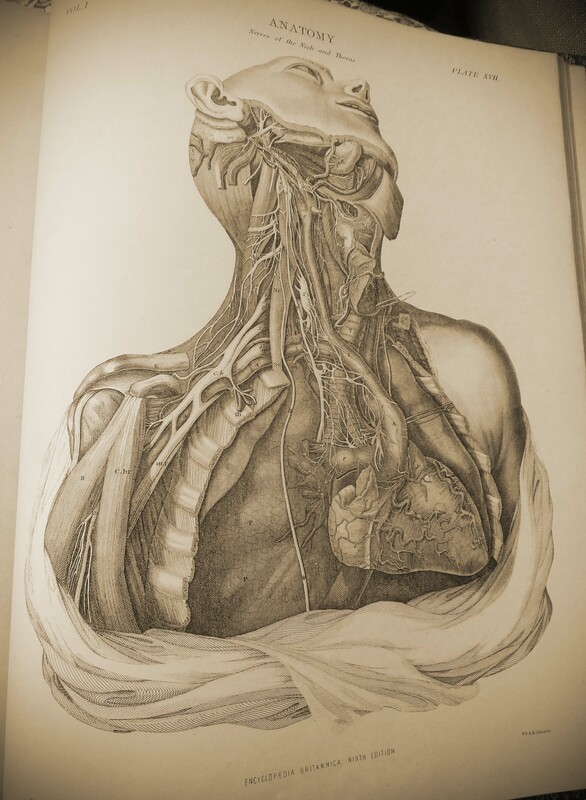 The Anatomy entry had me marvelling at the numerous detailed diagrams and outraged by the comments under the title, Mass and Weight of the Brain. It was the general consensus of the time that the size and mass of a brain was directly proportional to the level of intelligence enjoyed by its person resulting in inferences being formulated with regards to gender and race. Due to the fact that the heaviest brains were found to reside in the white races it was inaccurately concluded that the Europeans must be the most superior race and as male brains were found to be on average 10 % heavier than that of females they were crowned the more intelligent gender. 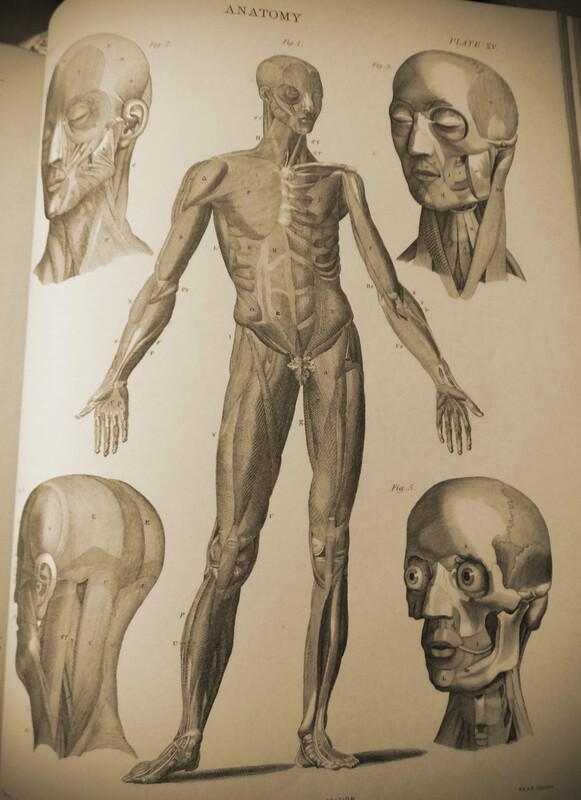 It was however observed and subsequently documented in the Britannica, using brains obtained from the West Riding Asylum, that the brains of the insane exhibited “high brain weights”. I am truly thankful that science, for the most part, has progressed from allowing this type of narrow-minded view of the world to influence its hypotheses and findings. Enough details to give you nightmares! As a scientist, I possess an unquenchable thirst for knowledge, I attempt to explain the unexplainable, and in so doing am sometimes guilty of explaining away the mystery that so fascinates me and was the source that initially drew me into the world of science. I relish the fact that there are still inexplicable phenomena to be found across the globe and in the far reaches of the universe, beyond our earthly realms. I still find wonder in nature; be it under a pebble or in a rock-pool, in the branches of a century-old yellowwood or a morning spent beachcombing, witnessing the flourishing recovery of a mountain after a fire or just the feel of the north wind on my face (the South-Easter just puts me, along with the rest of Cape Town, in a foul mood!). I am still (and always will be) fascinated by the strength and power displayed by Mother Nature. Reading the articles covering the various aspects of natural history highlighted the fact that in the days of the 1800s, the world was still considered to be full of mystery and intrigue and anyone venturing across their conservative borders to plunge into the unknown realms of uncharted expanses was synonymous with intrepid, fearless and celebrated explorers. Imagining myself as a child in the late 1880s, sitting crossed legged on the floor surrounded by these newly purchased tomes and reading about sea serpents, my imagination fires to life with thoughts of adventures across the majestic Seven Seas and the mighty jungles of the great Amazon. The names of the animals alone are enough to pique one’s fascination. Feathered camel, sea devil and sea wolf are the names listed for ostrich, angler fish and a species of blenny now known as an Atlantic wolffish. 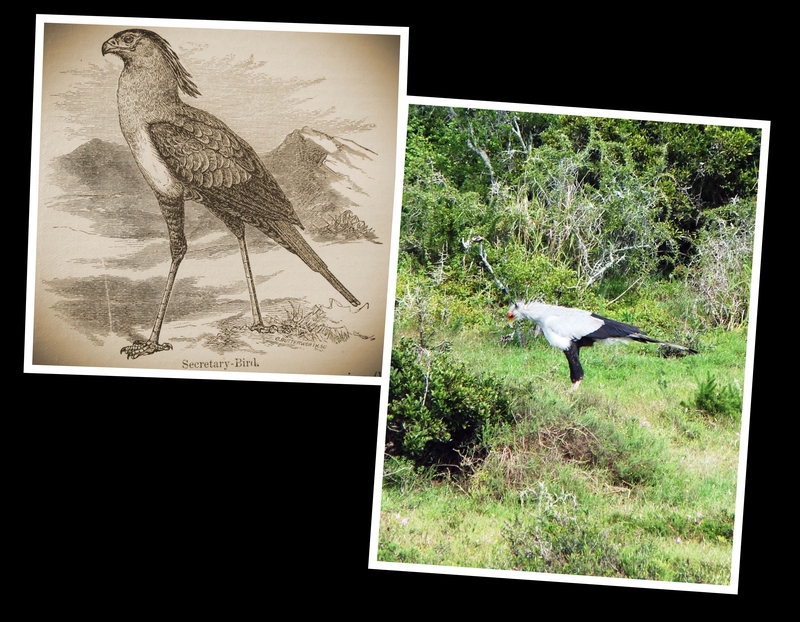 Even the simple story of how the secretary bird ended up with such as obscure name warrants a mention. François Le Vaillant described in his 1804 works a bird known in the Cape of Good Hope as “the Sagittarius or the Archer, from its striding gait being thought to resemble that of a bowman advancing to shoot”. 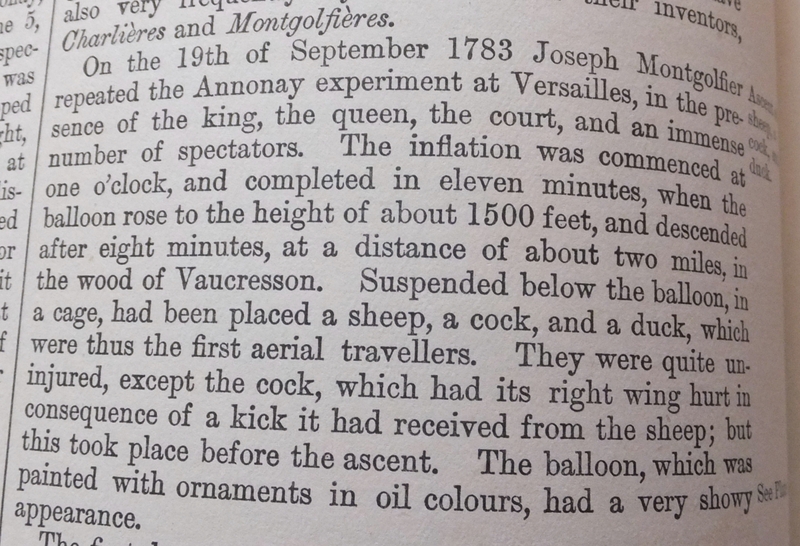 Not only was its name subsequently corrupted into that of Secretarius but evidence was provided by Le Vaillant to show that in 1719 this bird had been described but mistaken, by a “bad naturalist”, for a pelican that was just as easily confused with a spoonbill! Since this post is titled “Evolution of Knowledge”, my first mission was to search for anything relating to evolution and Charles Darwin and even though “Origin of the Species” had already been published in 1859, the only Darwin to be mentioned in this edition is Erasmus Darwin (1731-1802), the famous Charles Darwin’s great-uncle. Charles Darwin, and his theories on evolution, had to wait until after his death for recognition to be bestowed on him by Encyclopædia Britannica. While Evolution was mentioned for the first time in this edition (as a result of Darwin’s writings), it was still deemed to be a radical concept that should be treated with the utmost suspicion and therefore had to wait until the eleventh edition to be sufficiently detailed. 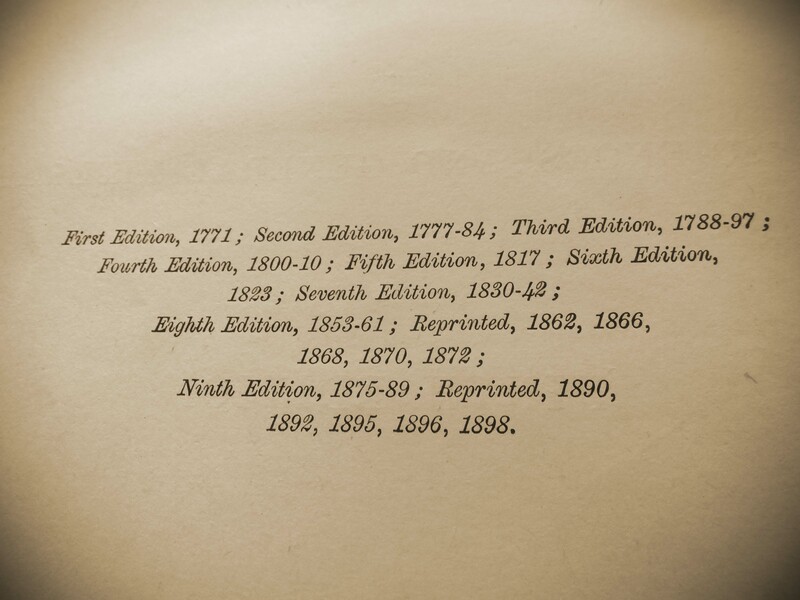 Interestingly enough, the only volume missing from this ninth edition set is the one containing the article, Evolution, and it has been missing since as far back as anyone living can remember. Not being able to uncover anything ground-breaking with regards to related topics, I decided to swing across the spectrum to the mystical and fantastical. A ribbonfish, attaining a length of 20 ft. While the most plausible explanation would seem to be the gigantic squid (taking into account the concept of shifting baselines and the effects of trophy hunting on size), various zoologists of the time supported the plesiosaurus theory often citing evidence in its favour. Such evidence included a report from Captain Hope of HMS Fly in the Gulf of California of a “creature with the body of an alligator, a long neck and four paddles”. A huge snake was recorded as being seen by the crew of the merchant vessel Pauline in the South Atlantic in 1875, “coiled twice round a large sperm whale and towering in the air before finally dragging it to the depths”. 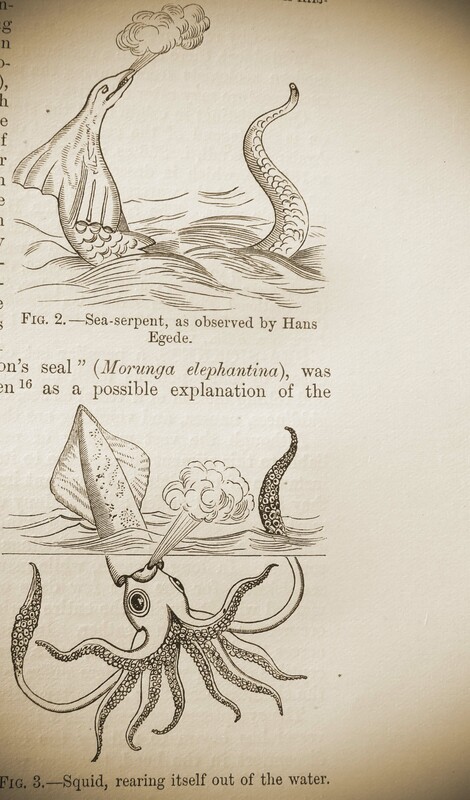 Sea serpent and the suggested explanation of a giant squid. In ranks, and squadrons, and right form of war”. Crimson auroras have often been imagined by the superstitious to be omens of war, pestilence and famine but throughout history every group of people has had their own term, interpretation and legend for these ethereal dancing polar lights. The Aurora Ancients characterised them according to their forms and colours; chasmata (from the Romans for their resemblance to the mouths of celestial caves), bolides (from the French for the extremely bright darts that resemble meteors that explode in the atmosphere) and trabes (beams). It is thought that early dragon legends of China originated from the Aurora, Chu-Long being Ancient Chinese for “candle dragon” and Thien lieh being Old Chinese for “cracks in Heaven”. In Ceylon they were known as “Buddha Lights”, in the Shetlands “Merry Dancers”, by the Eskimos as Sélamuit (sky dwellers), “Dance of the Dead” by the North American Indians and “Dancing Gods” by the Australian Aborigines (Eather 2013). The scientific theory presented in the ninth edition of the Encyclopædia Britannica was the electric hypothesis, the one “generally accepted by scientific men” and the one that “furnishes a plausible explanation of the phenomenon”. It was thought that the Aurora phenomenon was simply as a result of an electrical discharge in the upper atmosphere although it was noted that this theory left aspects of the mystery unsatisfactorily explained. The meteoric hypothesis, proposed by Dr Zehfuss and HJH Groneman of Gröningen, had not yet been accepted and was still being viewed with a great deal of suspicion as there was “no evidence that meteoric dust (even if it does exist) would produce this phenomenon”. The origin of iron particles found at the poles was still being questioned with the general consensus being that of volcanic rather than “stellar space”. 3 875 fathoms (4.4 miles or 7 086.6 m). On the 23 March 1875 the then thought to be deepest point of the ocean was measured at 8 184 m, the Mariana Trench and Challenger Deep having yet to be discovered. Modern soundings in the vicinity of the Challenger measurements have uncovered depths of up to 10 916 m.
Without the use of yellow rubber duckies, General Ocean Circulation was not an accepted concept of that time. Now known as the “Global Ocean Conveyer Belt” driven by both temperature and salinity (thermohaline circulation), in the 1800s it was understood as being driven strictly by temperature only. 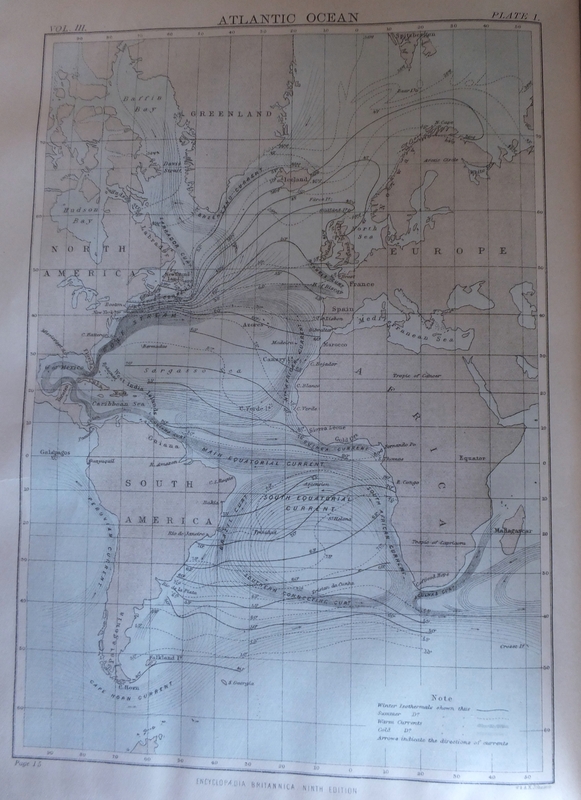 In 1845 Professor Lenz of St Petersburg concluded that “the whole of the deeper portion of the great ocean-basins in communication with the polar areas is occupied by polar water, which is constantly, though slowly, flowing towards the equator; whilst conversely the whole upper stratum of equatorial water is as constantly, though slowly, flowing towards one or both of the poles”. He even goes on to specifically describe the “existence of a belt of water under the equator, colder than that which lies either north or south of it, as an evidence that polar water is there continually rising from beneath towards the surface, a phenomenon which, he considered, admits of no other explanation”. Regardless of his findings, the scientific community awarded prevalence to the doctrine of Sir James Ross of a uniform deep-sea temperature of 39 ̊F (3.9 ̊C). This did not take into account the immense pressure, present at these great depths, being exerted on the instruments and as such negatively influencing the readings. I have barely scratched the surface in my analysis of the information presented as scientific fact for the Atlantic Ocean but as I am about to hop over on to my ninth page, I reckon I should move on to my last thought, the Pacific Ocean. My immediate impression was that there was more information available at the time for the Pacific Ocean than the Atlantic Ocean, 17 pages vs. 13 pages. On closer inspection it was mainly miniscule details on currents and temperature recordings for just about every location from Macquarie Island to Cape Horn. The article’s opening statement, however, was enough to get me intrigued; “The ancient world was ignorant of the existence of the vast expanse of water now known as the Pacific Ocean”. Referring to its existence, it is further written that; “For several hundred years the reports continued so uncertain, and were so loaded with the wild extravagance of travellers’ tales of the period, that it is difficult to get the facts from which they probably took their origin”. While there is a huge amount of information to sift through, a couple of things did stand out for me. The first being ooze. Apparently there were four types of “ooze”; globigerina, pteropod, diatom and radiolarian; that were discovered in different oceans and at different depths. To say that I was intrigued would be an understatement! I was hugely disappointed to find that this mysterious ooze was merely a term given to “all those truly pelagic deposits containing over 40 per cent of carbonate of lime which consisted principally of the dead shells” of pelagic species. 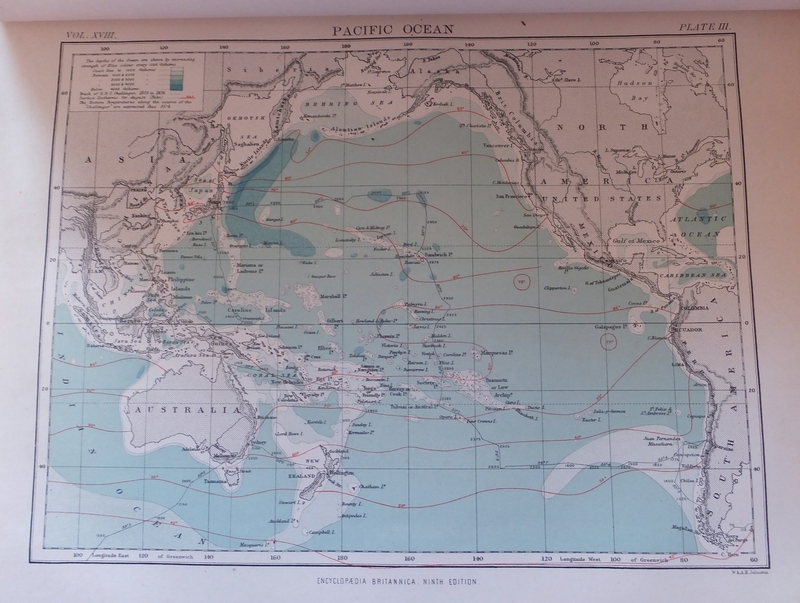 A great deal of attention was given to the two major coastlines forming the terrestrial boundaries of the Pacific, with special mention of the abundance of islands and volcanoes dotting its vast expanse. Reading the copious notes describing the bays, gulfs and beaches surrounding the Pacific brought a well-used phrase to mind; “A picture is worth a thousand words”. Perhaps it is for this very reason that encyclopaedias and other reference books now present their information in the most salient form, not wasting time or space on mammoth sentences and paragraphs, that very few people take the time to read, which can be succinctly summarised in a detailed map or simple diagram. The amount of information that we encounter and need to process on a daily basis has infinitely grown since the days of leather-bound encyclopaedic tomes and as such we tend to prefer our information to be presented in bite-size factoids and cool simulations. It is sad to think, however, that the days of waxing lyrical about, well, wax are gone. 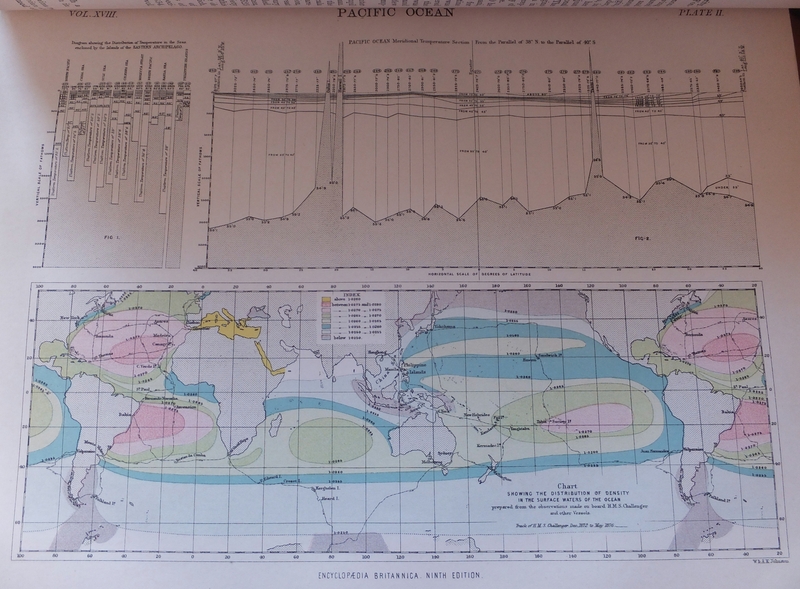 Pacific charts detailing the densities of surface waters as well as a depth profile. In closing, it is important to bear in mind that as this edition was published between 1875 and 1889, seven of the top ten greatest scientists were still alive and available for comment if they so wished! Marie Curie (1867-1934), Charles Darwin (1809-1882), Albert Einstein (1879-1955), Otto Hahn (1879-1968), James Clerk Maxwell (1831-1879), Louis Pasteur (1822-1895) and Nikola Tesla (1856-1943). I would just like to take a moment and thank my grandparents for allowing me to spend many afternoons and innumerable hours pouring over articles while surrounded by towering piles of their books. Thanks Sorethumb Gran and Gonx, hope you enjoy the finished product! EATHER RH. 2013. Majestic Lights: The Aurora in Science, History, and the Arts. Washington DC: American Geophysical Union. ENCYCLOPÆDIA BRITANNICA. 1875-1889. Ninth Edition. Edinburgh: A & C Black. WELLS JM. 1968. The Circle of Knowledge: Encyclopaedias Past and Present. Chicago: The Newberry Library. Fascinating read Sally! – perfectly compiled – kept me spell-bound ! – so says proud Dad! !….